Town in the government of Volhynia, Russia. Jews lived there as early as the sixteenth century, though the attitude of the Christian inhabitants toward them was distinctly hostile. In 1557 the Jewish community resolved that none of its members should buy property within the city, for there was danger of its being attacked or set on fire by the Christian inhabitants. In 1576 this decision was reaffirmed by the leaders of the community with the indorsement of R. Abraham Polyak. Those who had violated this rule were warned to sell their property to Christians, under penalty of a fine or of some other punishment. Outside the town the Jews owned eight parcels of land; some of them leased grist-mills, and others leased three lakes, paying for their leases in money, pepper, saffron, and salt fish to the total value of about 400 gold ducats. 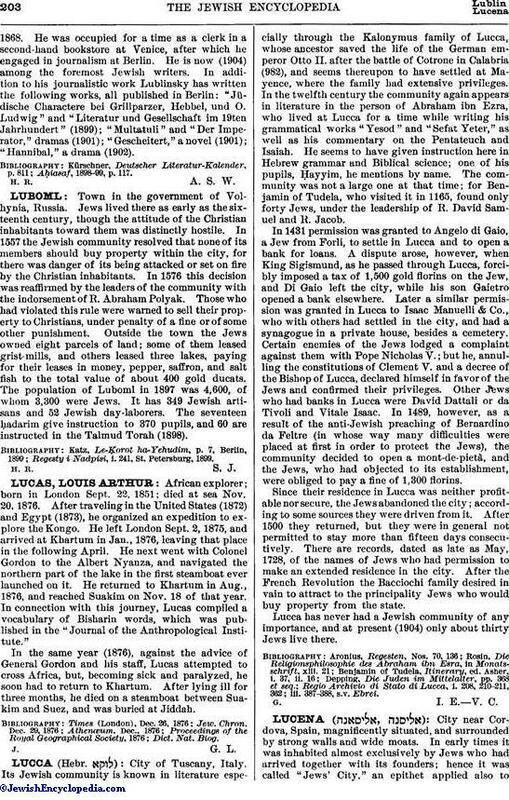 The population of Luboml in 1897 was 4,600, of whom 3,300 were Jews. It has 349 Jewish artisans and 52 Jewish day-laborers. The seventeen ḥadarim give instruction to 370 pupils, and 60 are instructed in the Talmud Torah (1898). Regesty i Nadpisi, i. 241, St. Petersburg, 1899.